Great tips including a reminder of how important it is to reach out with a call or text or note. Great article about the importance of discussing difficult topics with family in advance of a crisis and before end-of-life decisions need to be made. Thanksgiving is often a time when family concerns come to the surface, sometimes discussed and sometimes quietly considered. If you or your family is interested in exploring senior communities for a relative or friend, please check out http://www.stepwithcare.com. Step with Care will guide you through the process of identifying best options, visiting communities, comparing choices and organizing for a move. Involving an objective professional to advise you will likely make the process less stressful and more efficient, leading to better planning and more appropriate decisions. Wishing you a peaceful and happy holiday! Medical Alert Systems are an important tool in the effort to increase safety and peace of mind for older adults living alone. If you’re in the market for a Medical Alert System for yourself or someone else, be sure to check out the free advice on the Find the Right Alert website – http://findtherightalert.com/the-ultimate-guide-to-medical-alert-systems/. Thanks to Joe Thoron for sharing this valuable information, along with hints and tips and reviews! Helping aging parents move can be challenging in a variety of ways, but the benefits and peace of mind make the effort worthwhile for many adult children of seniors. 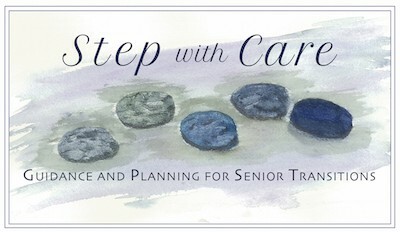 Step with Care (www.stepwithcare.com) is a resource for older adults and their families as they consider communities, identify priorities and preferences, and then focus on the options that best meet their needs. Recent studies show that loneliness has detrimental effects on the health of seniors — there’s mounting evidence linking loneliness to physical illness and to functional and cognitive decline. While Independent & Assisted Living Communities may not be appropriate for all seniors, they can be beneficial to some because of the activities and socialization they offer, countering isolation and loneliness experienced by many older adults. How can someone die from Alzheimer’s? Gene Wilder passed away last week at the age of 83, and according to his obituary, he died of complications from Alzheimer’s disease. While most people know that Alzheimer’s causes memory loss, not everyone understands that in the later stages of the disease, balance and coordination as well as autonomic functions like heart rate, breathing, digestion and sleep cycles are severely affected.